Everything comes together nicely at Mosaic, says Liz Feltham. 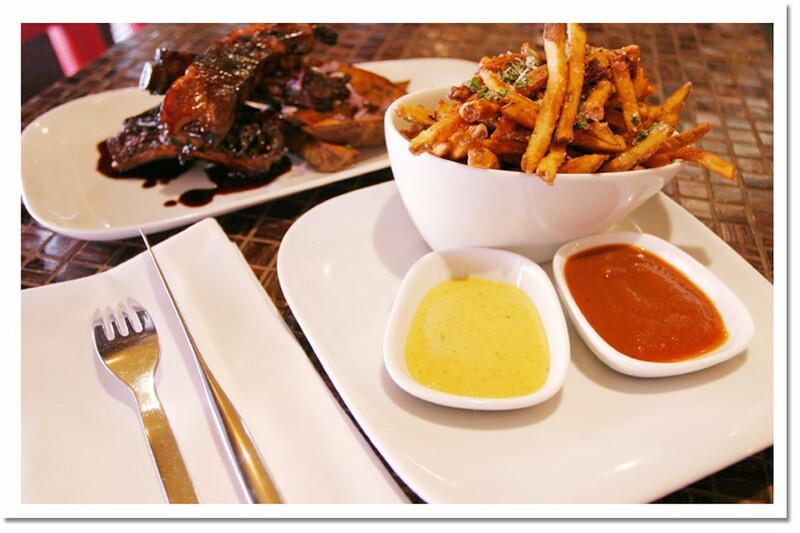 Fry times Pork back ribs and pomme frites with curry aioli and chipotle ketchup. A tapas and wine bar has been on my restaurant wish-list for a long time now, so I watched the opening of Mosaic with great interest and bated breath. With a culinary all-star team (the owners of Seven and Opa, and the Bertossi Group) backing Mosaic, expectations are high and with a few months of opening under its belt, I'm anxious to see if my wish has come true. I'm greeted warmly when I arrive and seated in the newly renovated expanded section. The addition looks seamless, despite the fact that it was only finished earlier that day. The interior of Mosaic is subtly elegant, with an air of plush comfort which effectively sets the tone that this is a serious wine bar—a place where friends can gather to enjoy a glass of something good, and relax. Deep reds, dark wood and glass-topped tables contribute to the luxurious atmosphere. There is a variety of seating choices, from intimate bar-height tables for two, to sectional sofas for groups. I settle into a barrel-style chair and, while waiting for a friend, peruse the menu. Mosaic offers "sharing" plates, featuring small portions of one or two items that can be shared, nibbled on, passed around and enjoyed as a meal, appetizer or just a snack. The menu lists about 20 such items and displays a remarkably global cuisine—from Asian to European influences, to New World ingredients. The rock-salt roasted-pork back ribs ($13) are served with a barbecue sauce on succotash (corn and beans). They are tender and certainly full of flavour, but a little messy to manage in this chic environment. I'm a big fan of tuna tartare and this one does not disappoint. Yellowfin tuna ($12) is chopped and seasoned, mixed with fresh herbs and served with sesame crackers. The soft, buttery texture of the tuna and the crisp, sharp taste of the cracker play off each other delightfully. On to the Dubliner cheddar and charred-tomato pie ($9), a miniature version of a rustic dish that retains all of its flavour in this form. The roasted tomato makes it sing while taking any possible bitter notes away. Tortilla of Cornish hen and chorizo with house-made salsa ($12) is good, but is my least favourite: The chorizo, a spicy Spanish sausage, is delicious. Sadly, the quail is overcooked and dry. Together, they do not work as well as the other plates. But I am excited by the arrival of pomme frites ($6), shoestring potatoes that have been fried and salted just so, and come with a spectacular smoky chipotle ketchup. My dinner companion, who is knowledgeable about wine, comments that the selection was better when Mosaic first opened. He does note, however, that there are still a large number of by-the-glass choices that should keep most guests happy. Although we're bordering on full, we choose to finish off with a cheese plate. Tonight's cheeses include the lovely Dubliner cheddar featured in the earlier tart, a smooth triple-cream Brie, a hard mild Manchego and a pleasantly pungent blue. Ample bread slices, crackers and fruit easily make this the best cheese plate in Metro. Mosaic Social Dining Lounge provides all that it has been designed to: a fabulous atmosphere for relaxing and enjoying time with friends, an accessible wine list, excellent cuisine and outstanding service. There's no doubt that, at least tonight, my wish has come true.